We launched a satisfaction survey in October 2017. Here are the results and next evolutions of the website to answer your needs! 95% of respondents are satisfied and would recommend our services to their friends; pretty good job! 6 % <= 2/5 ; more work to do to convince them. This question was only asked to those who bought at least one password. 84 % of respondents think that our rates are affordable and worth their price. Remember that we have a significant cost in terms of electricity, hosting, hardware,.. This fee goes towards keeping this website & services online. We try to find a good compromise between price and costs: 84% of you find this compromise good! 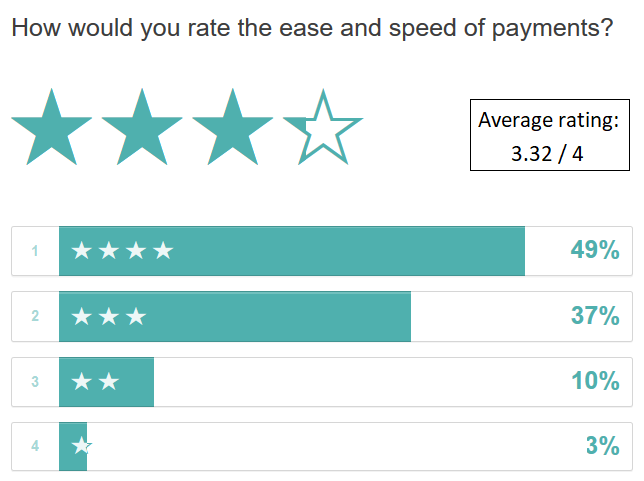 86 % of respondents find the payment options convenient. Speed of payments: we are transparent on process times here. Ease of payments: Paypal does not accept our kind of services, they fear fake/stolen payments from our customers. Finding a good, reliable and fast payment gateway is extremely difficult! We then asked you for your open comments, proposals and other suggestions to help us give you what you need. Yes, we do review each answer! We try to assemble them in categories in the following tables. Really. We cannot give everything for free, even if we add ads as you ask us. Electricity and hosting bills are too high for ads revenue. "Accept Zcash" "Accept Qiwi" "Accept Bitcoin"
"Accept Paypal" "Accept Russia payments" "Accept Google pay/wallet"
"Accept WeChat Pay" "Accept Paytm" "Accept Alipay"
"Accept Apple Pay" "Accept Webmoney" "Accept other altcoins"
"Accept Paysafecard" "Accept yandexmoney" "Having a payment balance on the account with 2FA"
Adding ZCash or other alcoins. - done. Bitcoin: already done since 2012. Investigate on others (Google, Apple, Paytm, Webmoney, Alipay, etc) to see if they accept us. Accept Russia payments if we find a reliable partner. "Payment balance on the account with 2FA" need to have a real account with all the needed security, first. Paypal does not accept our kind of services. We had 'only' a few comments about having a real user account with login and password to access to the dashboard. Our opinion on this is clear: we have (too!) much webservices where we must remember the login/password credentials, and we do not want to bother you with an nth couple to remember. The current system is simpler because only requires a link to access the dashboard. But we are flexible and we listen to you if there are more comments in this direction. "A login system to better track my passwords" "A login system will be nice "
"Better security: perso account" "I think a user account feature would be great"
"To somehow be able to login or pull up my account without really having the physical link." "I like to have a user panel through login (fb or google login)"
Some of your comments about WPA tasks. We had plenty of comments, here are the popular ones. "Get faster result" "Less expensive WPA" "Your wordlists do not suit my needs"
"I would like to choose a specific wordlists" "Give it for free when password is easy (like 123456789)" "Broader info about ip/dns and historical info"
Not sure to understand what "Broader info" means but we can show some information about the @MAC and SSID. Some of your comments about the need of a mobile app. We will not code an app for iOS or Android. Our website is already responsive, and we continue to enhance this responsiveness. When you capture a WPA handshakes or extract a NTLM hash from a Windows OS, you do it from a computer, not from a phone. That's why we think it's more convenient to use our services from a computer and not from a phone. "Do you have apps for Android and IOS?" "Mobile app" "Native mobile app"
"making an Android app to capture wpa2 handshakes" "Phone application" "Application for smartphones"
Enhance the responsive design, to use our website from a phone/tablet. Some of your comments about the need of an API or CLI tool. "A client that allows the users to lease you their setup's computing power" "Add API" "Do you have tools (eg. CLI)?" "A command line tool. For bash and powershell" "cli tool, REST api, pre loaded credits" "The ability to submit wpa captures via command line with a custom script or api "
API to request our database and upload handshakes and hashes. If you are developer and want to help us on this project, contact us! Some of your comments about the need to communicate/advertise more. "Add Cracking tutorials" "Doing some promotional videos and giveaways" "Education. Definitely try to teach the user about what's going on behind the scenes more." "dumpz cracking" "add faqs" "Have a scheduled e-mail notification for in-progress task after fixed interval." "hmm sms notfication ?" "I think serving more tools regarding hashs and passwords is a good way to attracting users." "Increased marketing honestly. The service is excellent"
"more statistics" "Provide information about each type of encryption per service you offer. Provide sources to educate users adequately about what exactly they are doing, and examples of attack methods on different encryptions. Basically, teach the users about the processes you go through to decrypt." "Share more details on how the passwords are being cracked. Which techniques are used and how are they combined?" "How about a service where we can do a quick check to see whether a wifi password is secure based on whether it resides in one of your password databases." "Mobile text notification" "Use Have I been pwned online service to check if a password is already leaked"
Very good idea: "Check if a password is secure/leaked or not" through our DBs and online leaks + complexity checks. More statistics: done! Hashes and Office. "More details on how the passwords are being cracked"
Tutorials, videos, .. why not, but it takes a lot of time to build that. We prefer to enhance our cracking capability first. But we are open to anyone who can help us making videos and tutorials. SMS / mobile text notificaiton: cost too much. Or maybe you know a cheap service for that? Pay for ads (adsense etc) to promote us. We prefer word of mouth. Add more algorithms for hashes and Office. "Better pricing options" "Bundle pricings for multiple passwords" "A free try"
"A subscription service. Say £10 a month for 5 hashes or handshakes to be cracked." "Allow more then 10 characters free." "Free service?" "offer private hashing service" "All for free" "Subscipt: Unlimited hashs run for X amount of dollars/month"
Free try: done! Here is how to test our services for free. "private hashing service": already done, just contact us. The pricing model for WPA has been improved: first wordlist is free - others are paying - and password display is free - more details here. Subscription model: a good idea yes, but it will need a recurrent billing, which is not feasible with our current payment gateways. If you know this kind of gateway please contact us! Everything free: come on.. We have hosting, hardware and electricity cost to pay. "CSV result exporting feature" "add progress bar/time, estimated crack time" "Automatic hash detection"
"the How To's would looks better as a blog posts" "give a choice dictionary option" "Having the ability to submit multiple hashes from a text file"
"be able to submit more hashes at once" "make a form to reduce wpa .cap file for me" "give the user the possibility to choose from wordlists"
"fix the responsive design" "robust hash identification" "Wordlists choosing"
CSV result exporting feature / done! Fix the responsive design / done! A form to reduce wpa .cap file / done! Wordlists choosing: already done for WPA (details here). Need to do the same for hashes and Office. "robust hash identification": Already done here. Moreoever users are supposed to know the algorithm. "estimated crack time": nobody on Earth can guess this.